Blindspot 2017: Canada 150: C.R.A.Z.Y. With it being Pride Month in Canada, culminating with this weekend’s Toronto Pride Parade, I figured that an appropriate selection for this month’s Blindspot would be Jean-Marc Vallée’s 2005 breakthrough film C.R.A.Z.Y. Born on Christmas Day to conservative Christian parents Gervais (Michel Côté) and Laurianne (Danielle Proulx), Zachary Beaulieu (Marc-André Grondin) is the second youngest of a family of five boys. As a kid, Zac had a close relationship with his father, but it began to dissipate as Zac showed signs that he was possibly homosexual. Over the years, Zac tries to repress him homosexual nature and even begins seeing a girl named Michelle (Natasha Thompson). However, Zac soon comes to accept who he really is. Before finding success in the United States with films such as Dallas Buyers Club and Wild, as well as the HBO series Big Little Lies, Jean-Marc Vallée hit it big at the French-Canadian box office with his fourth feature film C.R.A.Z.Y., which went on to win an astounding eleven Genie Awards. The film is a coming-of-age story about a young gay man living in the very homophobic period of the 1960s and 1970s. At the core of the plot of C.R.A.Z.Y. is the relationship between Zachary Beaulieu and his father Gervais. The two start off having a quite close relationship with each other, however it begins to dissipate as Zac begins to show non-masculine behaviour. After hearing Gervais’ concerns about Zac “becoming a fairy,” he tries to live a normal heterosexual life, despite dressing flamboyantly and showing more interest towards men than women. Zac also has a very complicated relationship with his older brother Raymond (Pierre-Luc Brillant), whose drug habit has turned him into the black sheep of the family. 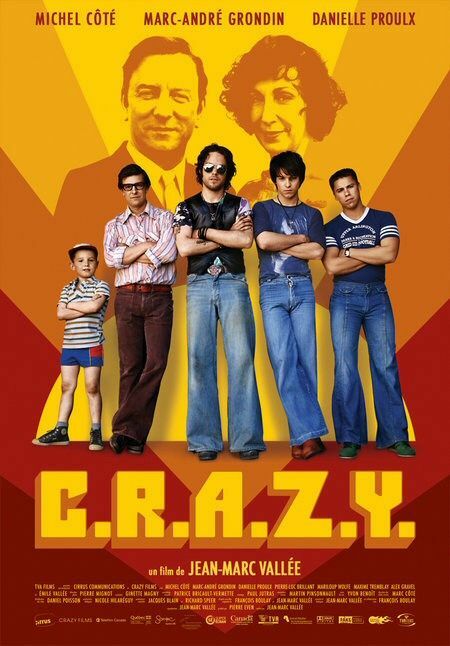 While I will say that I liked the film, I do have to admit that C.R.A.Z.Y. stumbled a bit for me in the final act, which involves Zac going on a soul-searching trip. However, the film definitely stands out among the Canadian films released in the last fifteen years and it is almost a shame that Jean-Marc Vallée has since moved on towards greener pastures.